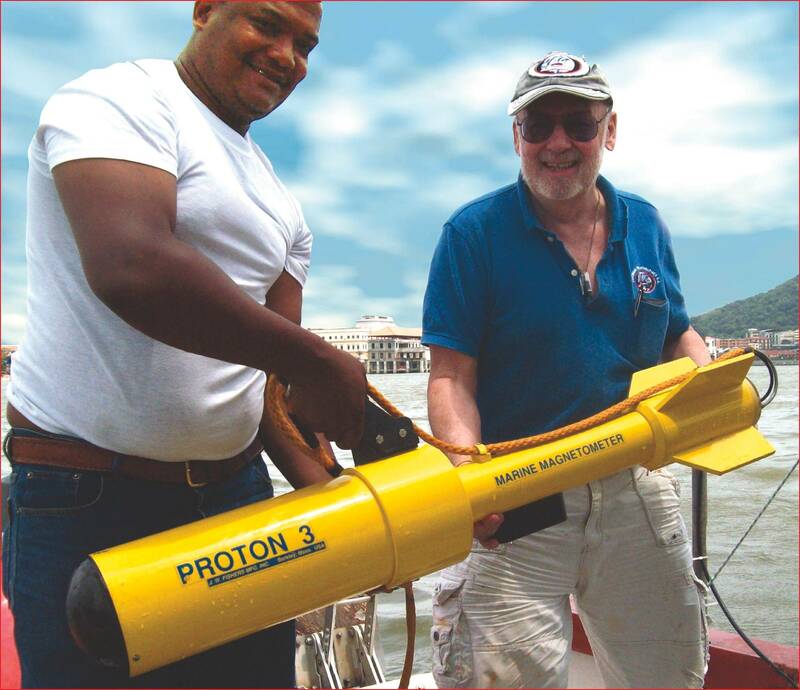 Russell Bennett (r) prepares to survey for shipwreck sites in Panama’s old harbor area with his JW Fishers Proton magnetometer. Presidential Palace is visible in the background between the two men. A number of archaeological groups and marine service companies are acquiring boat-towed metal detectors to assist in locating shipwrecks and to perform geophysical surveys. These devices can locate a variety of targets including the piles of magnetic ballast stones found on many old wrecks, gold and silver bars, cannons, anchors, pipelines, cables, and various metal debris which must be removed from an area before dredging. The two primary pieces of equipment used in these operations are a magnetometer and pulse induction (PI) metal detectors. Magnetometers are super sensitive instruments that can detect iron and steel objects at hundreds of feet away. The boat-towed PI detectors locate all types of metals, while ignoring the high mineralization in the ocean environment. Russell Bennett, an American living in Panama is helping the country’s antiquities ministry (INAC) locate and map historic wreck sites in the city’s old port area (circa 1720 - 1859). Before construction begins on a new causeway, Panamanian officials want to know of any wrecks that may lie along the planned route. Bennett has more than 20 years experience in mag surveys. Several of the projects were Pro Bono, including the search for a downed aircraft along the Darien coast and helping hunt for a lost ship that sank in a storm near Punta Mala. Using his JW Fisher Proton magnetometer Mr. Bennett and his assistants found several sites of significance along the proposed path of the new causeway, documented their positions, and gave the data to government authorities. Dr. Phillip Lobel got his PhD at Harvard and teaches fish biology at Boston University. His scientific work has focused on field studies of fish behavior and ecology. For more than 20 years his main study area was Johnston Attoll, a tiny island in the Pacific Ocean 750 nautical miles from Hawaii. This US outpost was bombed by the Japanese shortly after Pearl Harbor, and during the 50s and 60s became a US nuclear test site. In the 1980’s the island became a chemical weapons depot and the site of the Johnston Atoll Chemical Agent Disposal System (JACADS). Lobel conducted research for the army as part of a marine ecological monitoring program. While conducting magnetic survey operations around the island using a Fisher Proton magnetometer, the professor and his team discovered the remains of an old military seaplane and a whaling ship. Texas-based Terrasond provides hydrographic surveys, land surveys, and geophysical surveys to clients worldwide. Their mission is to help customers navigate safely, develop resources, and protect the environment by providing information about the earth. Their team consists of hydrographers, geophysicists, geologists, oceanographers, cartographers, GIS and CADD specialists working with the company’s own vessels and equipment. Their clients are in the oil and gas industries, power and telecon, as well as US and foreign government agencies. Recently Terrasond was hired to survey a shallow water oil field near Corpus Christi that was littered with debris. The equipment they were using for canal work was not adequate for this type of project. To assist in the operation the company acquired JW Fishers Pulse 12 boat-towed metal detector. With a range of 16 feet, and the ability to detect both ferrous and nonferrous targets, the Pulse 12 could be towed far enough from the bottom to avoid obstacles and still detect the debris that needed to be cleared from the area. Engwirda Marine in Queensland, Australia provides clients with commercial diving and marine construction services. Their extensive inventory of equipment includes a self propelled crane barge and a Fisher Proton 4 magnetometer. The company was recently contracted to locate a lost anchor from a very large coal ship. Using their mag with Fishers Tracker software, the search team was able to see on their laptop computer the track of the boat as it moved over the search area, and capture position coordinates of each mag readout. An altimeter attached to the belly of the magnetometer allowed the team to see the distance between the towfish and the bottom, ensuring the equipment was towed close enough to be effective, yet far enough away to avoid collision with any obstructions. Managing director Jim Engwirda reports it didn’t take long to find the missing anchor. Nixon Antony with Neel Underwater Services in Cochin, India says the Fisher Pulse 10 metal detector has been extremely useful in helping them locate pipelines and cables which cross the area’s many waterways. The recorded location of these lines is often inaccurate and their exact position must be know before dredging or construction projects can be undertaken. A few more of the many agencies and companies using Fishers towed detection systems are the US Army Corps of Engineers, Sitka Tribe of Alaska, Williamson Marine Services in Hong Kong, the Royal Australian Navy, Diver Marine Services in United Arab Emirates, India’s National Institute of Oceanography, the Search & Rescue Society of British Columbia, Clive Cussler’s NUMA, Mel Fisher’s Salvors Inc., Natural Resources Canada and Wahkiakum County Sheriff in Washington State.